Are you a one-God man/woman? Do you restrict yourself to praying to your One and no other? I pray on an everyday basis to a number of Hindu deities. I do have my own One, the One who always listens with a sympathetic ear to whatever I happen to go on about. I also have a Second-to-the-One for days when I am not on speaking terms with my One. What, you don’t have ‘I’m-SO-annoyed-with-you’ moments with your One? You must be much better tempered than I am!! Of course I also pray to different deities for their expertise in specific matters. I am most certainly not a one-God woman! My meanderings arise from something I heard recently. I had mentioned a few weeks earlier that I have taken to listening to upanyasams (lectures on spiritual matters), mainly by Velukkudi Krishnan, Dushyant Sridhar and Visaka Hari. Velukkudi Krishnan is especially erudite; his depth of knowledge is quite astounding! Is it possible to learn this much in a lifetime? I am all admiration! Much as I admire his knowledge, I confess that at times I am confounded by some of his pronouncements!! For example, he says in one of his lectures that people should sleep in what they wear ‘normally’ and not change into night-clothes! Really??!! Leaving pronouncements such as this aside, there was one repeated advice which caught my attention. He says that if you serve Lord Vishnu, then you should pray to none other as otherwise He would be offended! Again – Really???? Surely these kind of feelings are human, not Divine? Velukkudi Krishnan does add that it is the same for whichever religion/deity you adhere to; ‘stick to your One’ he says. I personally do not know even one single Hindu who prays to only one deity! When the Hindu pantheon offers a veritable smorgasbord of deities, each with their own domain expertise, is it not human nature to pray to as many of them as you can relate to? Leave alone Hindus, even in a strictly monotheistic religion like Christianity, prayers are offered to not just their God, but also to His messenger Jesus Christ and to his mother Mary as well as any number of Saints. Many of the Saints have their own speciality ‘domains’ too! I have visited many Catholic places of worship; there are as many candles in front of the Saints as there are in front of Jesus! Listening often to Sufi music, I see that even Muslims sing in praise of and in prayer to their many Saints. Many of us, it seems, spread our prayers wide! Coming to Carnatic Music, our great composers wrote in praise of many different deities though they were known for their devotion to particular ones. For example, Tyagaraja was a devotee of Lord Rama, Dikshithar was a worshipper of Goddess Shakti, and Oothukkadu Venkata Subbaiyer was entranced by the young Lord Krishna. Yet in my song choice of today, Tyagaraja says ‘I am the one who chants only your name, I shall not beseech others!’. Set to Raga Natta, it is a lovely composition which appeals to me greatly. I always enjoy Natta with its vigorous and rousing feel. But today the first rendition I have chosen for you has a more contemplative mood. M.D. Ramanathan has a unique sound, one I enjoy immensely, especially in songs such as this. For your ease of listening, I have chosen the rendition loaded in YouTube. The sound quality is poor, but the music is anything but. Listen to my ‘Alternative’ for slightly better sound and a longer rendition. Alternative : Click here and play song 2. Free membership needed to Sangeethapriya. The second rendition I would like you to listen to is by Jayanthi Kumaresh on the Veena. I find that the resonance of the instrument is particularly suited for Natta, don’t you? This talented artist has gifted us with a hypnotic rendition. Don’t miss this! Alternate link : Click here and play song 1. You need free membership to Sangeethapriya. And for a third, listen to this energetic and vibrant performance by Sikkil Gurucharan here. I really enjoyed the kalpana swarams. Again, the recording quality is not the best. Please note that I do not speak Telugu; the lyrics and translations are credit to various online resources. I am a worshipper (bhajana sEyu vADanu) only of you (ninnE). 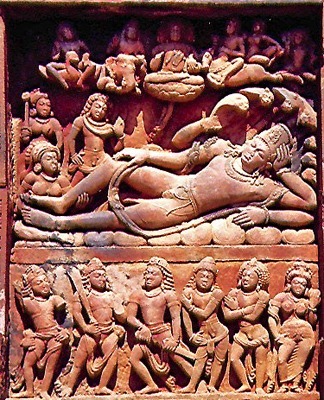 O One recumbent (shAyi) on a snake (pannaga)! I shall not (lEnu) plead (vEDa) to anyone else (paralu). You are the provider (prada) of happiness and well-being (sukha) which come from (implied) bathing in holy waters (snAna), repeated prayers (japa), penance (tapa), Yoga, meditation (dhyAna), deep concentration leading to identification with the object of meditation (samAdhi) etc (Adi). O Consort (nAtha) of Sita! O Guardian (pAlaka) of the entire (sakala) world (lOka)! O One praised (sannuta) by Tyagaraja!